The bì cuốn chay is a blend of bì chay, thick rice vermicelli noodles, baby cucumber sticks, Vietnamese mint and Thai basil wrapped in a bánh tráng (rice paper disk). It is served with a simple soy sauce-based dipping sauce called nước chấm, nước mắm (fish sauce) or a peanut sauce (recipe follows in the tip section). We had some bì chay yesterday. I served it with bún (thick rice vermicelli noodles). When served together, it is called Bún chay. In many ways, the dish is basically a deconstructed spring roll. That made deciding what to do with the leftovers really easy. Without much effort, you'll get two meals out of the same dish. And did I mention that it is absolutely delicious? Cut the cucumber into 2-3 inch matchsticks (depending on the size of your spring rolls). Wash the bean sprouts and drain through a salad spinner. Repeat the same procedure with the mint and basil. Remove as much liquid as possible. Fill a saucepan with water. Bring the water to a boil. Let cool a bit. Quickly dip the rice papers, one at a time into the warm water and place on a clean flat surface. Wait about 1 or 2 minutes. The rice paper should be soft but not too wet. I usually dip 4 rice papers at a time, then start wrapping. Place 2 leaves of mint and basil, 3-4 cucumber "matchsticks", the same amount of bean sprouts in the center, about 1-1/2 inches from the bottom edge . Carefully fold each side flap and roll away from you. If the rice paper is moistened properly, it should easily stick and roll. Tuck all the mixture into the wrapper, forming a cigar. Continue until all the bì chay is used. Cut the spring rolls in half in a bias. Place 4 halves per iceberg lettuce leaf. Serve with nước chấm or peanut dipping sauce. Bánh tráng are dried rice paper sheets. I buy the Ba Co Gai (Three Ladies) brand for this dish. 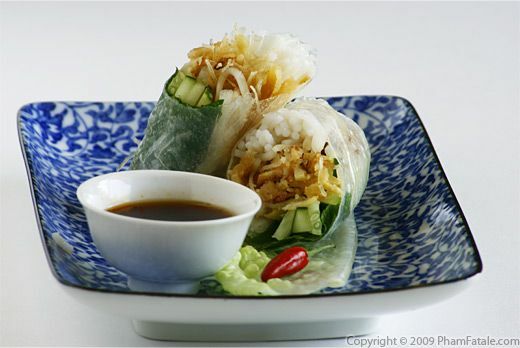 The rice paper isn't too thick, yet strong enough not to easily break on contact of moisture. I use the same brand for my phở noodles. You can find all these ingredients in any Asian store. For the thick rice vermicelli noodles, just boil the noodles as you would for regular pasta. Drain thoroughly. Let cool completely. I use a similar peanut base as to the one for my peanut tofu satay for the peanut sauce. Just dissolve 2 tablespoons of brown sugar with 1/3 cup of lime juice, 1/3 cup of coconut milk and 2 tablespoons of water to thin the sauce a little. Warm the mixture (until the sugar is completely dissolved). Add about 2 tablespoons of soy sauce (I use Ponzu for its lemony flavor), 1/2 teaspoon of ginger-garlic paste, 1/4 cup of hoisin sauce, 1/2 cup of creamy peanut butter and a drizzle of toasted sesame oil. Voilà! If you want, you can add black fungus mushrooms, pickled carrot and daikon, pickled pearl onion, fresh pineapple or bamboo shoots. I didn't add any of these ingredients as it adds more moisture to the filling; the spring rolls can get soggy if not eaten right away. For an additional crunch, you can add coarsely ground peanuts.